College of the Mainland’s Student Success Strategic Plan advances the College’s mission, vision and values, while supporting institutional effectiveness and student success. COM’s strategic planning model is described below and is depicted in the graphic representation included in this document. The College’s mission, vision and values drive the development of the strategic plan. The mission statement represents the essential purpose of the College, i.e., what the College does and why. The vision statement represents what the College hopes to achieve over time, and the values represent core elements of the College’s philosophical perspective. This review process occurs every three years such that the strategic plan can be updated to remain current and relevant. College of the Mainland is a learning-centered, comprehensive community college dedicated to student success and the intellectual and economic enrichment of the diverse communities we serve. College of the Mainland will be a valued and vital community partner by enriching our community and preparing our students to thrive in a diverse, dynamic and global environment. College of the Mainland will develop processes and procedures to ensure that students have a successful start to their college experience. College of the Mainland will eliminate obstacles from the student’s pathway as they proceed on their academic journey. College of the Mainland will enhance student engagement, keeping the students interested in staying on course. College of the Mainland will provide high-quality instruction and instructional support services. College of the Mainland will provide services/processes that enhance the integrity/safety/quality of the institution (including physical facilities) and that enhance the quality of the faculty and staff. College of the Mainland will provide services/processes that connect the College to the community in a mutually growth-enhancing cycle. Each year the College leadership meets in January to establish the Annual Plan, which consists of priorities for the following academic year. The leadership consists of the BOT, the President, the President’s Cabinet, upper-level administrators, and campus constituency leaders, who collectively bring to the discussion knowledge of essential aspects of the College’s operations. The leadership identifies an annual priority for each of the College’s strategic goals, and these annual priorities guide the decision-making of the SSC committees dedicated to the realization of each goal. Those annual priorities are entered into Strategic Planning Online as the College’s Annual Plan, where measurable outcomes are identified and documented. Thus, the three-year strategic plan consists of the three annual plans developed to implement specific strategies in support of each of the strategic goals. The College of the Mainland Student Success Council (SSC) oversees the implementation of the College’s student success agenda, such that students are effectively and equitably served in every facet of their academic journey. The SSC consists of key campus leaders and constituency heads with decision-making power, such that recommendations developed by each of the six SSC committees can move forward efficiently. The co-chairs of each committee sit on the SSC, which allows for maximum communication and coordination among the six committees, each of which, as noted previously, is dedicated to a particular strategic goal and annual priority. Eliminate artificial boundaries among student success interventions. Identify services which need to be scaled up or eliminated. Increase communication among various campus programs and services. Each strategic goal remains relevant and active, as there is a committee dedicated to the realization of each goal. Each of the strategic goals is aligned with a mission of a SSC committee, representing the facets of the student’s experience which have been identified as critical to student success, and thus, the strategic goals are unlikely to become obsolete. There is broad campus involvement in the development and implementation of interventions to support the strategic goals of the College. Each of the six SSC committees formulates recommendations in support of the annual priority/strategic goal assigned to that committee based on a review of data, current campus practices, available resources, and evaluation of best practices. Recommendations are forwarded to the SSC for review and approval. The approved recommendations are then submitted to the President and the Cabinet for review and final approval for implementation. Following final approval, the Cabinet assigns each recommendation to the appropriate campus unit(s) for implementation. Each of the approximately sixty-five units on the College of the Mainland campus develops an annual unit plan, which consists of the various functions of that particular unit. Each unit develops objectives and criteria for success and identifies a means of assessment for each objective in its annual unit plan. SSC recommendations assigned to a unit by the President and the Cabinet are incorporated into that unit’s annual plan. Every three years, each administrative and instructional unit conducts an evaluation of its operations over the three-year period under review, drawing not only from the annual unit plans but also from data and a qualitative assessment of key unit activities and achievements. Each unit identifies how it has supported the College’s mission, vision, values, strategic goals, and annual priorities over the preceding three-year period. The Student Success Data Committee, which evolved from COM’s Achieving the Dream Data Committee, functions as a data review body in conjunction with both the SSC and the IEC (discussed below). This committee reviews data and disseminates key findings to the campus, making efforts to ensure that the functions and decisions of each College unit are data-informed. All assessment activities related to the strategic plan are overseen by the IEC. The members of the IEC systematically review the unit plans to ensure that the elements of the strategic plan are assessed in a comprehensive manner. A final annual report summarizes how each of the annual priorities was implemented and the extent to which each was achieved. It is through the assessment of the annual priorities attached to each strategic goal that the strategic plan is assessed. College of the Mainland’s strategic planning model ensures that the College’s strategic goals are tied to key elements of student success and are assessed in a comprehensive and systematic manner. Through the Student Success Council’s broad representation of the campus community it is ensured that there is campus-wide participation in the strategic planning process. This strategic planning model provides a process which embeds the College’s mission, vision, and values in all aspects of the College’s operations. 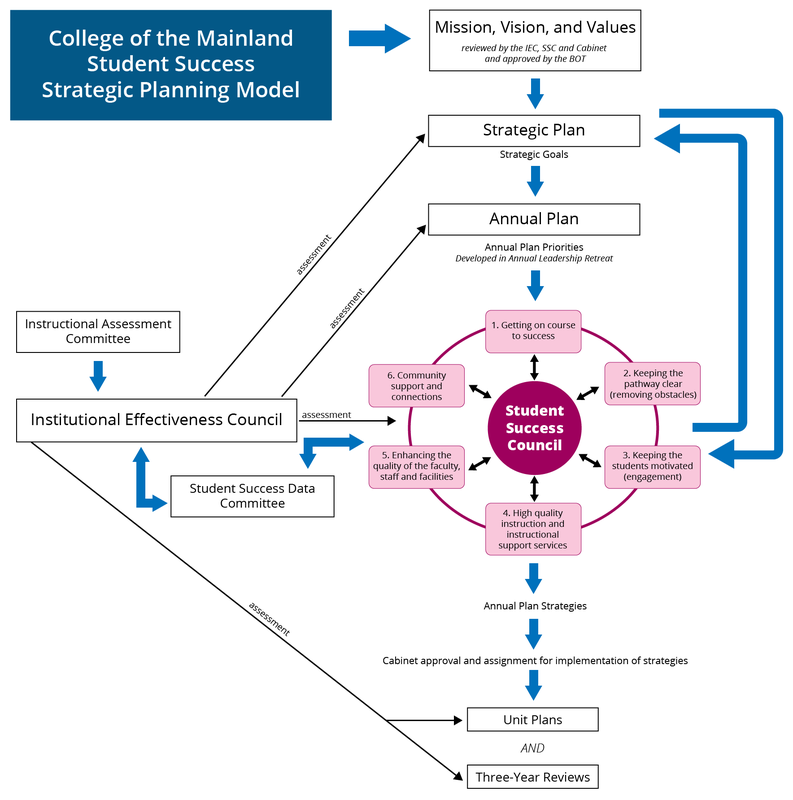 The College of the Mainland’s strategic planning model is summarized in the graphic representation on the following page.